Would you like a sneak peak at some of the items inside the barn for the upcoming auction? 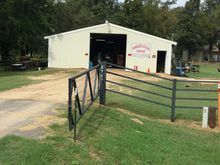 We display our photos on AuctionZip.com and you can get there quickly by clicking on the photo of the auction barn to the right. Once on AuctionZip, simply click on "View Photo Gallery" and voila! Photos are generally updated on the Tuesday prior to auction day. WHAT'S INSIDE THE BARN THIS AUCTION?